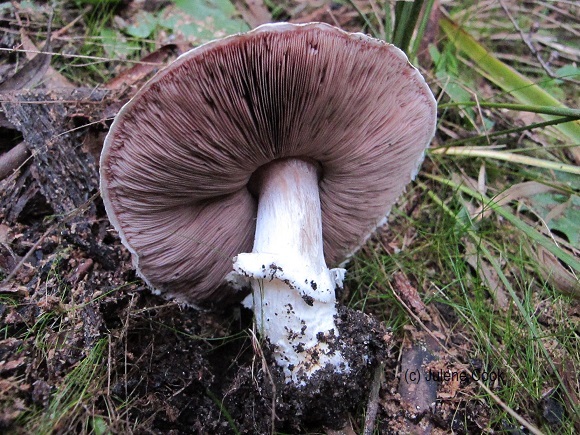 The Agaricus genus of mushrooms include the common field mushroom & swiss brown. Their gills stain dark brown with their dark brown spores. 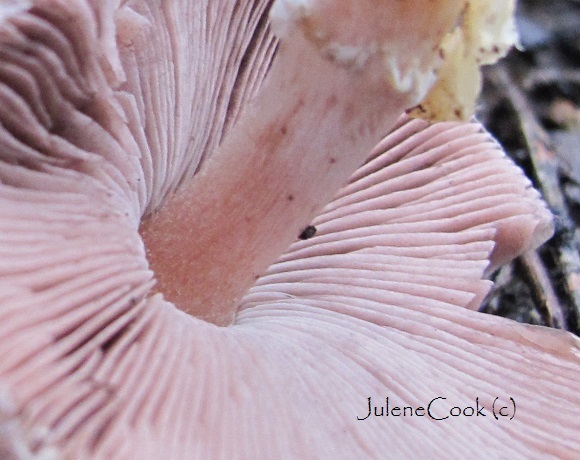 The gills are free from the stem which clean breaks from the fungi cap. 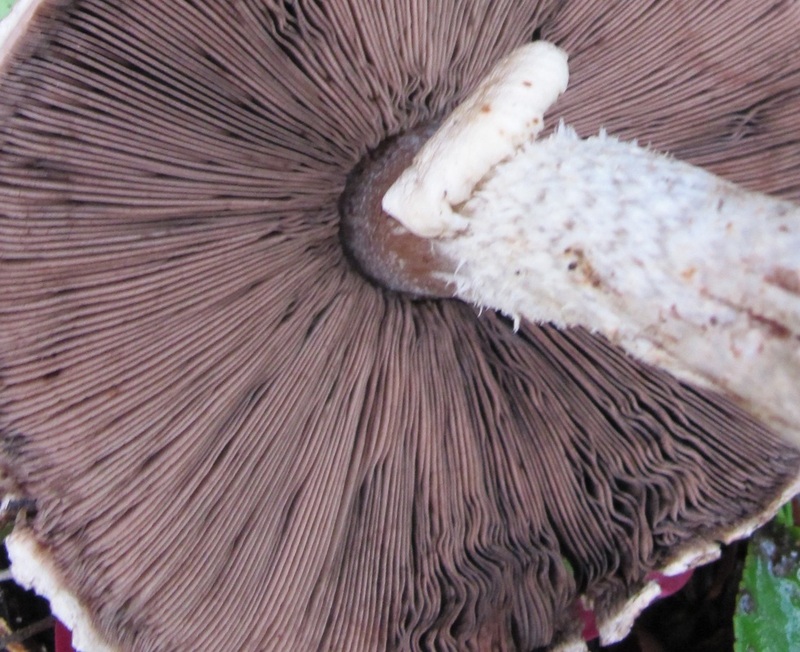 The stems of Agaricus fungi have a distinct ring, are white or cream and are quite fibrous but vary in fragility. The skin can be white and smooth, wine coloured, pink or brown with small scales. It slightly overhangs the edge and is easily peeled right to the centre. 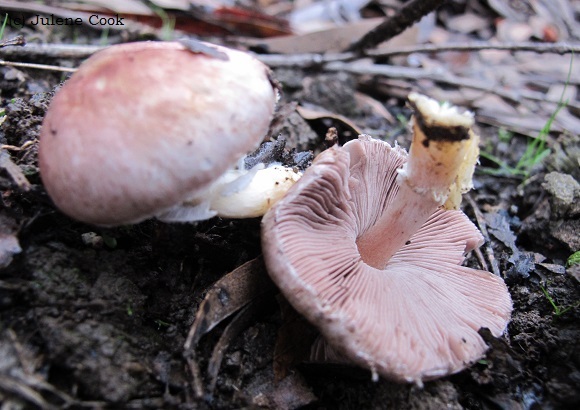 Most Agaricus fungi are edible but the edibility of some Australian species is unknown. FungiOz app includes several unidentified species. 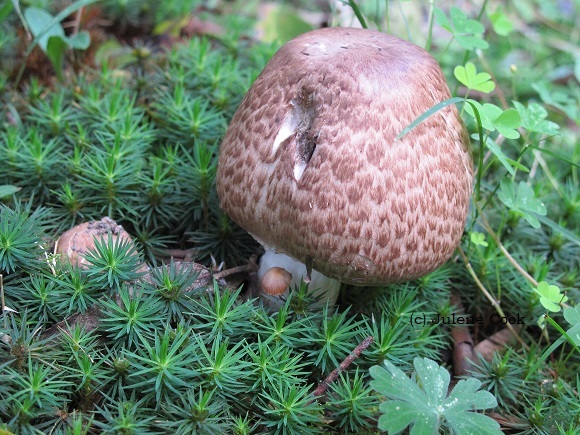 It is very easy to mistake the poisonous yellow stainer, Agaricus Xanthodermis for an edible field mushroom. Click here for a detailed comparison between the yellow stainer and edible look-alikes. Cap: 10 cm, convex becoming flatter, with wine coloured minute scales, deeper at the centre but with a pale ring around margins that slightly extend beyond gills. Flesh: Slight reddish staining, especially above stem. Gills: Wine brown and darkening, free, close, smooth. Stem: Solid, central, tapered upwards, with a wide floppy ring and white adhesions below. Found: Solitary to several, close to eucalypts. Caps: To 20 cm, ovoid then broadly convex, then flat, reddish brown with flat scales, skin peels, margin ragged, flesh white. Gills: Cream, then brown and darkening, free, close, smooth. Stem: Cylindrical, white with pinkish tinges especially under cap, becoming hollow, pendulous ring. Found: On well composted, rich soils in shady places. Gills: Cream, then brown and darkening, free, close, smooth, ringed. Found: In spring on well composted, rich soils in shady places. View more Australian Agaricus Mushrooms on FungiOz app.